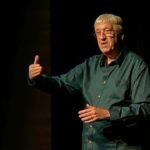 I gave a talk on Storytelling at my 50th Dartmouth College Reunion last month. Following is the text of my introduction. 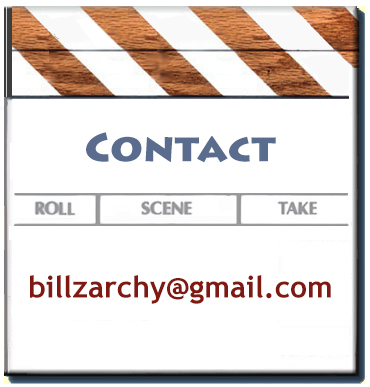 If you want to see the whole presentation, including video clips and stories, click on the video player below titled Storytelling Bill Zarchy. Closed Captions (CC) available. Thanks to Susan Zarchy for the photos. Click here to download an eight-page handout of Storytelling Resources. About two-and-a-half years ago, a friend of mine had a gig playing classical guitar at The Marsh, a club in Berkeley that was hosting a monthly storytelling night called Tell It On Tuesday. She urged me to come along. After she finished playing, five people, all roughly my age, stood up in turn and told stories. I was entranced. By that time, I had been listening to The Moth, the storytelling show on National Public Radio, for years. I had written and published a memoir, had read some of my stories at several book launches and other events, and I knew I loved readingin public. This story event at Tell It On Tuesday felt very familiar, except for one thing: none of these tellers were reading. They all TOLD their stories off the cuff, in the oral tradition, without text or notes. 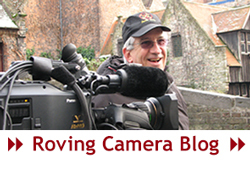 Some background: I was lucky enough to have a great career, hooking up with people and productions that took me all around the world, shooting film and video projects on six continents, in about 30 countries. I shot some concerts and documentaries, but most of my work was for Silicon Valley companies. In the later years, I often worked for medical technology clients. Late in the last century, I began to write about my work and travels. In the early days, I would scribble a few pages in a fax to my family while I was on the road. Then later I wrote extensive emails to my wife and kids, describing where I was and what I was doing. Then, as an afterthought, I copied my parents, other family, and a few friends as well. In the spring of 2000, I was hired to shoot a project about the spread of technology to remote areas of the world, with three separate journeys to Costa Rica, Alaska, and India. By then, I had my own website, and I began to post a daily travel journal of these three remarkable trips: photos, notes, observations, and anecdotes about meeting people, filming our assignments, and the often-interesting story of what was going on behindthe scenes, either with our small film crew, or with the folks we met along the way. This was 18 years ago, and no one called it a travel blog yet. The other guys on my crew told their friends and families, and they all enjoyed reading about our exploits. When we got to India, the crew we hired there had already read about our shoots in Costa Rica and Alaska. That was a big deal in 2000. After that shoot, I began to write about more of my productions. I taught Advanced Cinematography and Lighting to grad students at San Francisco State for twelve years, and blogged and sold some technical articles about filmmaking, but my heart has always been with the non-technical side, the playful, poignant, personal stories taking place on the other side of the camera. 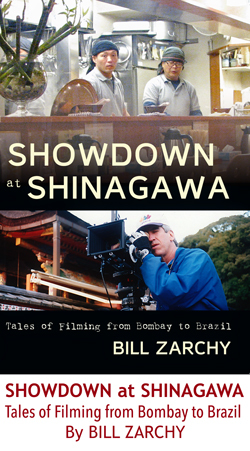 I assembled 18 of these pieces into my first book, the memoir I mentioned, Showdown at Shinagawa: Tales of Filming from Bombay to Brazil. But now I’m retired from the film business and I’ve reinvented myself as a storyteller. The oral tradition. No notes, no text. Why storytelling? I am intrigued by its universal appeal, the fact that most cultures have an oral tradition of stories handed down from mouth to ear for thousands of years of human prehistory. Long before there was a written Bible, many of those tales existed in oral form. Just to be clear, I’m defining a “story” as a sequential, event-by-event narrative, in the form of “First we went to the station. Then it started to rain. So I called my mom, who picked us up for dinner. Later, the giant rabbit attacked us.” This includes novels, Hollywood screenplays, and my uncle’s account of his visit to the proctologist. “When we are being tolda story, things change dramatically. Not only are the language processing parts in our brain activated, but any other areas in our brain that we would use when experiencing the events of the story are too. “Stories can be a way for humans to feel that we have control over the world. They allow people to see patterns where there is chaos, meaning where there is randomness. Humans are inclined to see narratives where there are none because it can afford meaning to our lives—a form of existential problem-solving. I’m very comfortable with this medium, even though I’m terrible at memorization. I certainly use some of the same language each time, in specific spots, but as a rule, most storytellers don’t memorize fixed scripts. I think of the learning process as absorbing the story, wrapping my head around it, then reproducing it as needed. I use notes when learning the story, but mostly just bullet points to remember the order of events. One of my storytelling teachers, who is a few years older than I am and has been telling since she was a little girl, never writes anythingdown. A remarkable brain! If I asked you to tell me how you found your house or met your spouse, you’d know how to tell that story. If I ask you again tomorrow or in a week, you’ll tell me the same story, possibly worded a bit differently or in a slightly different order. If you ask my Atlanta cousins about their cruise, or selling a car, or their daughter’s wedding, they’ll say, “Ooh. Let me tell you that story.” And then they do. We all have stories. It’s verbal jazz, really. Each telling refines the tale. It never comes out the same way twice, and that gives it a genuine quality, a special charm. Because the teller isn’t reading, eye contact with the audience is an important factor. It’s all about live interaction. I’m no expert. I’ve been doing this less than three years. But I’m here to tell you that this can be fabulous fun—often moving and transformative—for both teller and listener. Storytelling is a profoundly stimulating form of creativity, and an ever-changing source of live entertainment. Storytelling is also remarkably accessible in nearly every part of the world, the reason I included so many resources in the handout packet. Please note this is a partial list to get you started, not exhaustive. Of course, the variety of stories to tell is endless. I love personal and travel stories, but I embrace the broad range of possibilities, including Historical, Folk, and Traditional stories. The tellers I saw that night at Tell It On Tuesday all came from Stagebridge, a senior performance theatre company in Oakland that offers classes in storytelling. Last October, exactly two years after I witnessed my first “telling” at The Marsh in Berkeley, I was on the bill at Tell It On Tuesday as one of Stagebridge’s tellers. 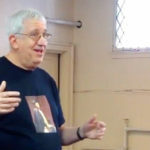 I recently finished the EPIC program, a two-year course of study in storytelling at Stagebridge, which includes classes in performance techniques and telling in a variety of genres. The final course helped me overcome my fear of telling stories to children. Yesterday was the program graduation party, but I missed it to come here instead. For my final project in the program this April, I produced and performed a one-man solo storytelling show at a small club in Berkeley. 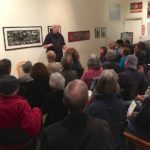 I challenged and amazed myself by telling eight stories in all, including a couple of folk tales and a historical piece about FDR. The rest were about family and travel, and one was based on a printed story in my book. Links to videos of my solo show are included in your packet. I’m going to show you four brief video clips of my work, from different parts of the world. After each clip, I’ll present four of the tales in my book. First I’ll READ two of the stories, then I’ll TELL the other two. That’s the end of the text of my ten-minute introduction. 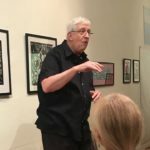 If you want to see the whole, one-hour presentation, including video clips and stories, click on the video player above titled Storytelling Bill Zarchy. Closed Captions (CC) available.